You know what I loved about Dead Space? Everything. From the immersive atmosphere to the fluid controls to the outstanding presentation, I seriously loved everything about Dead Space. And you know what's great about Dead Space 2? If you guessed "everything," you're absolutely right. Anything that was great about the original is improved in at least some small way here, if not completely revamped. For instance, like myself, you might have thought the plasma cutter from Dead Space was already the perfect weapon. Well, ask yourself this: What if it could set stuff on fire, too? I know, right? Brilliant. And that's pretty indicative of how Dead Space 2 approaches things. Even if the first game already totally nailed something, the developers found some way to top themselves here, even if sometimes only slightly. Consequently, a lot of the improvements feel kind of minor, but some of them are pretty major. The weapon and enemy variety have both gotten a major creative overhaul, delivering some of the coolest weapons and enemies in any game, ever. 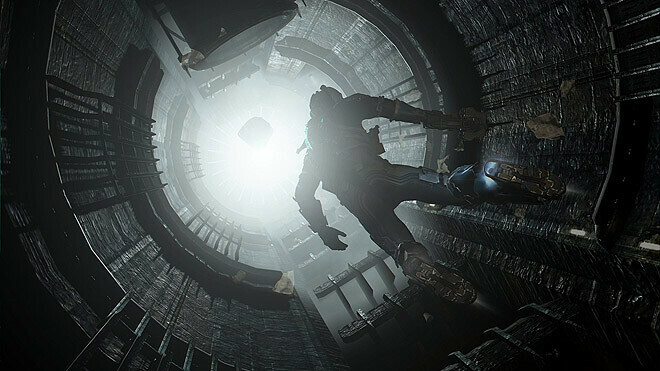 Dead Space 2 proves that you don't have to sacrifice fun for fear. Yeah, I felt pretty powerful and very capable, especially by the game's end. I'd maxed out the upgrades on my suit, powered up my favorite weapons, and stocked up on supplies. Yet still, I'd occasionally be rushing past enemies, scrambling to get to the safety of the next door, my heart threatening to punch its way out of my chest. Another thing that sets Dead Space 2 apart from the first game is a clear examination of what made Uncharted 2 such an awesome game: mind-blowing set piece moments. 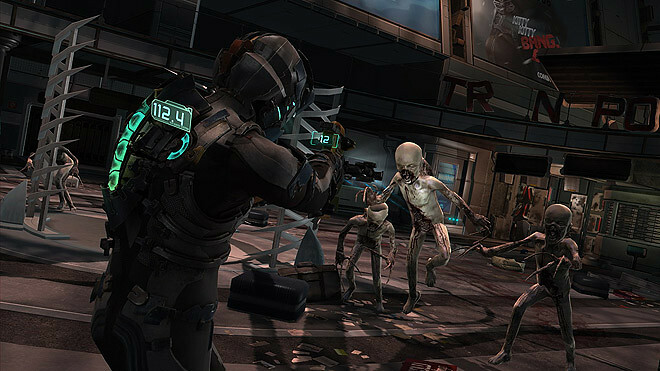 Whether it's sliding through an exploding train that leaves you dangling upside down, fighting for your life, or an incredibly nerve-wracking three-way battle with a gunship and a huge enemy called the Tormentor that spills out into space, Dead Space 2 knows exactly how and when to spice things up. The big changes in the story come from Isaac's newfound ability to speak, and the new location of the Sprawl, a city on one of the moons of Jupiter called Titan. Surprisingly, besides allowing for much more variety in the environments, setting the game on a whole city instead of a starship doesn't really change the gameplay at all, but it does mean that you won't feel as alone as you did in Dead Space. Isaac runs into people face-to-face, retracting his mask and actually conversing. He's the kind of no-nonsense character who typically says exactly what you'll be thinking, and in general, the quality of the writing and voice acting is just as good, if not better than, the first game. But I definitely did miss the feeling of being alone and helpless. Dead Space 2 starts louder and faster than Dead Space did, dropping Isaac in the middle of an outbreak rather than in the aftermath of one. It's a jarring opening, but it's jarring on purpose, and it works well. I was a little afraid that it meant Dead Space 2 would forget the quiet, "okay, I'm just freaking myself out now" scares of the first game in favor of blockbuster action and thrills, but the game proves pretty quickly that it's still a master of all types of horror. The game's stellar audio-visual presentation really does add to the atmosphere, with phenomenal lighting and excellent ambient sounds. The only forgettable part of the game is the multiplayer, which can pretty much be summed up as "Left 4 Dead in space." Obviously, it's a little more nuanced than that, but there's simply nothing compelling enough to keep you coming back beyond a base desire to continue dismembering after you've beaten the game. Even then, Dead Space 2's outstanding "New Game +" modes that encourage you to replay the story are much better for scratching that itch. The multiplayer just isn't very satisfying since everyone respawns infinitely and it all just boils down to a war of attrition. It's not especially challenging, or scary, or fun. But it's not a blemish on the rest of the game by any means. Plain and simple, Dead Space 2 represents the pinnacle of the modern survival horror game: It's fast, it's frightening, and it's really, really fun. It manages to keep you on edge, jumping at every shadow, yet still with a constant, goofy grin.